Here’s what happened in last night’s game, in which our heroes have a lucky escape and then try again. The PCs discuss in whispered voices what might happen if Neronvain finds them in his stronghold and decide to act first. Gwastdyn casts a wall of fire across the tunnel that the elf went down, then Turin casts fog cloud as the elves on the ledge nock arrows to their bows. 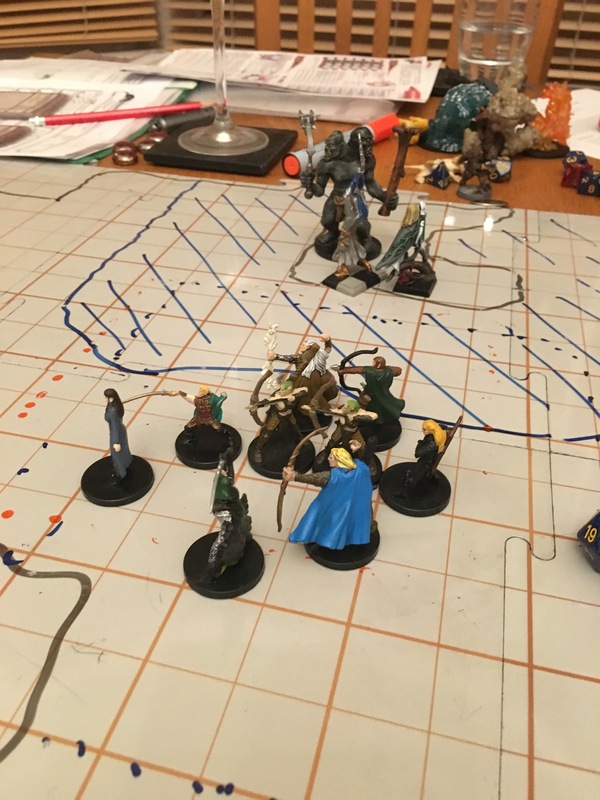 The elf mage casts ice storm in the area where the PCs are standing, then three ettins appear through the cloud to attack the party. One goes down quickly, but things get worse as Neronvain appears out of the pool riding the green dragon Chuth. Ug battles the ettins while the dragon attacks Turin who loses concentration on his fog cloud. The elf uses dimension doorto flee to the ledge where the mage and archers had been standing. Chuth breathes poison on Rosie and Gwastdyn who have retreated towards the entrance. As the elves enter the fray, firing bows at Ug, the paladin misty stepsto the island in the middle of the pool. The ettins swim after her and she takes one of them down. Meanwhile, Gwastdyn has wildshaped into an air elemental and is keeping Neronvain and the dragon busy while Rosie and Crake make ranged attacks and move towards the entrance. Rosie briefly considers giving up the black dragon mask to facilitate their escape, but dismisses the thought. The warlock levitates up the slope but is struck by an eldritch arrowfrom Neronvain and falls unconscious. Crake feeds her a potion of healing and the three of them escape through the tunnel as the druid’s wall of fire drops and cultists charge into the room. Turin uses another dimension door to rescue Ug from the island and take her to safety. Retreating some distance from the dragon’s lair, the PCs rest and recuperate. Casting protection from poison and water breathing, the PCs return to the caves. Gwastdyn wildshapes into a giant eagle and flies invisibly through the waterfall into the lair; the others follow using dimension door to arrive on the high ledge where the elves sleep. Chuth has been waiting for the PCs, clinging to the ceiling, and flies down to attack. Turin casts fear to scare off half the elves while the others move into melee, led by their knight. The mage casts cone of cold and another elf shoves Gwastdyn off the ledge to the floor below. Fearing Chuth is about to breathe, Rosie opens the door to hide behind it. When she realises the corridor leads to the ettin chamber, she sneaks back and closes it. Gwastdyn casts wall of stone to seal off the tunnel to the cultist quarters again. The ettin bashes down the door but Turin’s fear spell sends it packing. 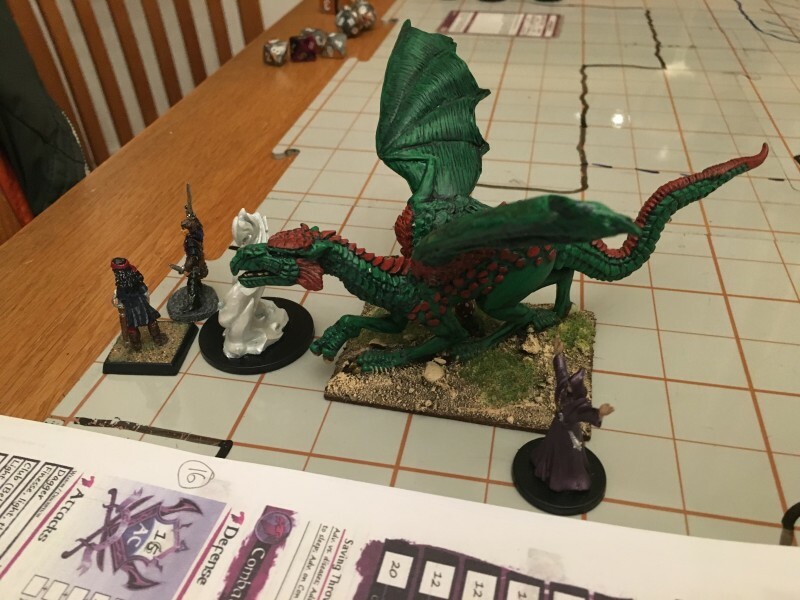 Chuth flies around and makes another attack, but the dragon has been damaged by sneak attacks from Crake, Ug’s slash, and Rosie’s agonizing blasts and has had enough. It dives into the pool and disappears. The mage also vanishes and the surviving five elves surrender, claiming to have been forced to serve the dragon. Rosie tells them to grab their weapons and go and kill the ettin. They flee for the entrance instead – the PCs let them go. The PCs go after the ettin while Crake keeps watch from the ledge for when Gwastdyn’s wall of stone vanishes. They slay the ettin in its filthy lair. The invisible mage attacks again with a fireball, then she too seems to have fled. The druid has a quick look down the corridor the cultists appeared from before the others tell him to come back. Rosie casts Leomund’s tiny hut and the PCs take a short rest.